From Fred William's, "History of Gate City II:"
One of the Lodge's most notable sons was Henry W. Grady, the eminent journalist and the leading spokesman of the "New South" toward the end of the Nineteenth Century. A native of Athens, Georgia, and a graduate of the University of Georgia, Grady bought an interest in the Atlanta Constitution in 1880. Although he did not become a Freemason until entering Gate City in 1888, at age 37, his legendary charity, willingness to champion worthy causes, and forthright calls for harmony and good will had given indication that his was a spirit well attuned to the principles of the Craft. He was an excellent speaker (he claimed to be a "talker" by inheritance, his father having been an Irishman, and his mother a woman! ), and his keen insight and uncommon common sense were in great demand. 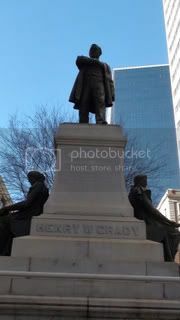 He contracted a severe cold while in Boston on a speaking engagement in December 1889; it worsened into pneumonia prior to his return to Atlanta, and on December 23, 1889, Henry Grady died, aged 39 years. The passing of such a man was a tragedy of national scope, and a Lodge of Sorrow was held, with the brethren of the Lodge marching in solemn procession to the First Methodist Church where the service was held. Gate City's 1912 "History" stated that "in many respects, this was the most impressive and sacred Masonic service ever held in Atlanta." 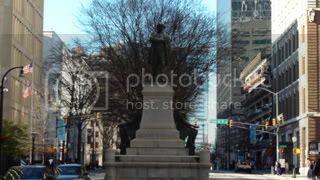 The twenty foot monument to Grady was sculpted by Alexander Doyle (1858 - 1922) and is located at the Intersection of Marietta and Forsyth Streets, Atlanta, Georgia, USA, outside the headquarters of Henry Grady's old haunt, the Atlanta Journal-Constitution. The monument was originally dedicated on October 21, 1891. 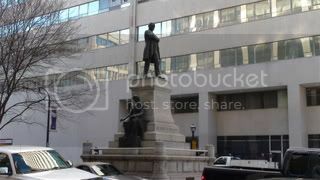 Journalist, Orator, Patriot, Editor of the Atlanta Constitution. Born Athens, Georgia, May 24th 1850. Died in Atlanta December 23rd 1889. Graduated at the State University in the year 1868. He never held or sought public office." "When he died he was literally loving a nation into peace. The citizen standing in the doorway of his home - contended on his threshold - his family gathered about his hearthstone- while the evening of a well spent day closes in scenes and sounds that are dearest he shall save the republic when the drum taps is frugal. University of Virginia, June 23, 1880. Grady County, Georgia and Grady, County Oklahoma, Henry W. Grady High School, Henry W. Grady Hospital and The Henry W. Grady College of Journalism and Mass Communication at the University of Georgia were all named in his honor. The College of Journalism named for him annually awards the George Foster Peabody Awards. 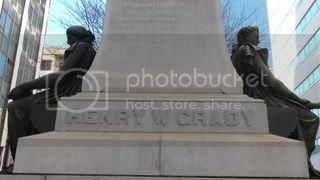 Henry W. Grady is Interred in Westview Cemetery, Atlanta, GA, where the Square and Compasses seem to rival the Cross for dominant symbology. The tragedy of the broken column is consoled by accomplishments that live on after the untimely call home. The memory of his greatness has already outlasted his short life span of 39 years by a multiple of three. Henry W. Grady, 1850 - 1889.